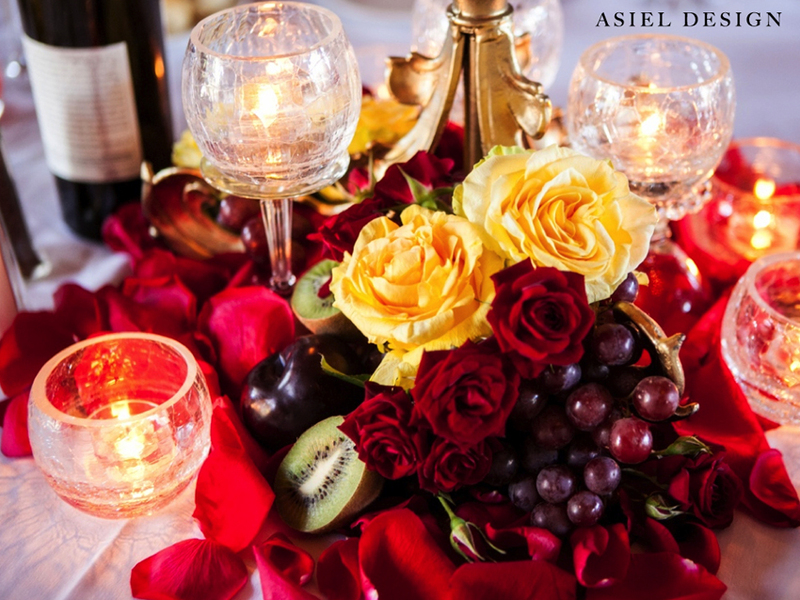 At ASIEL DESIGN, we are known for creating trend setting photo shoots. But a question that we often get is; “do people actually do this stuff for events?” And the answer to that question is “yes.” Urania and Sean’s wedding is a good example of a wedding that stepped a bit out side the box. 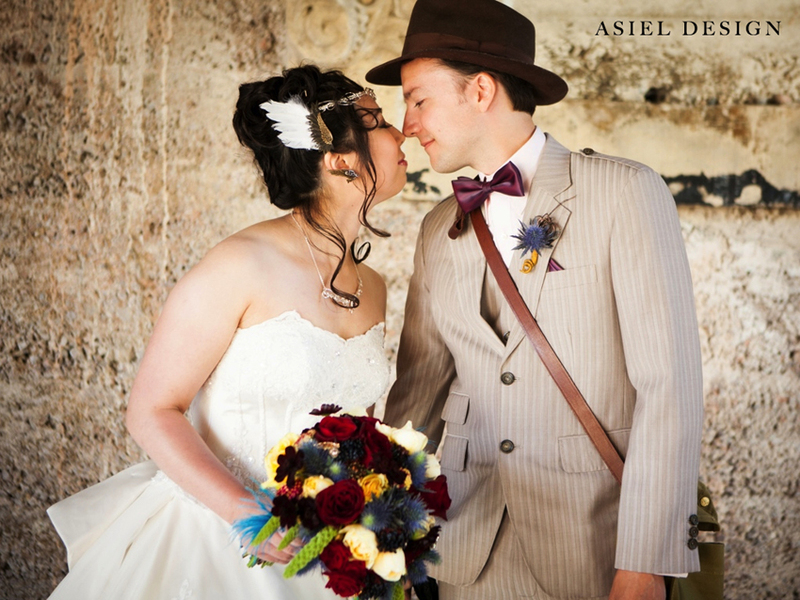 This couple chose to have a super heroes’ adventured themed wedding and also chose to have Steampunk elements incorporated into their décor. I call weddings like this, “indie weddings.” Much like indie music, indie weddings are not the norm but rather a reflection of the couple that are getting married. 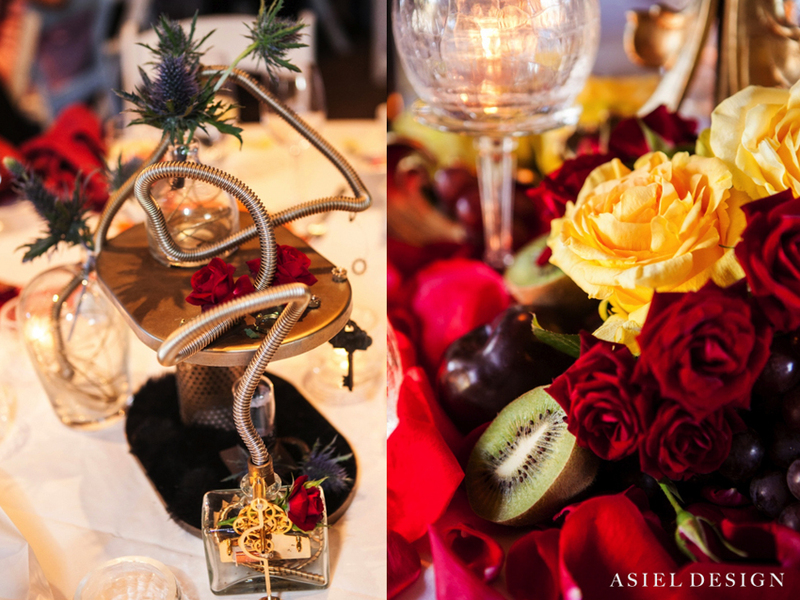 The theme, the style and décor all reflect the couple. 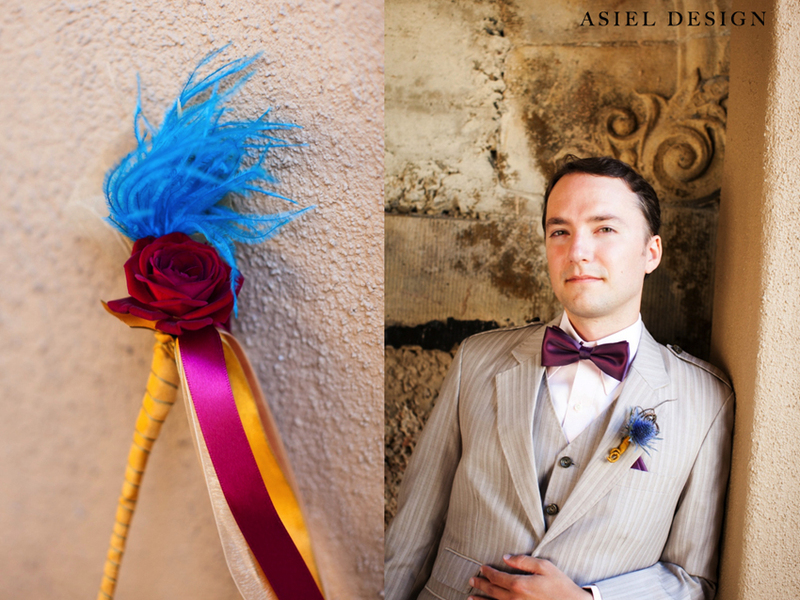 We often ask our clients: “if a person that knew you well were to walk into your wedding, would they know it was your wedding simply by the way the event was put together?” For Sean and Urania their family and friends definitely knew it was their wedding. Sean opted out of having a traditional black tux and went with a suit, hat, and “man bag” that evoked Indiana Jones. 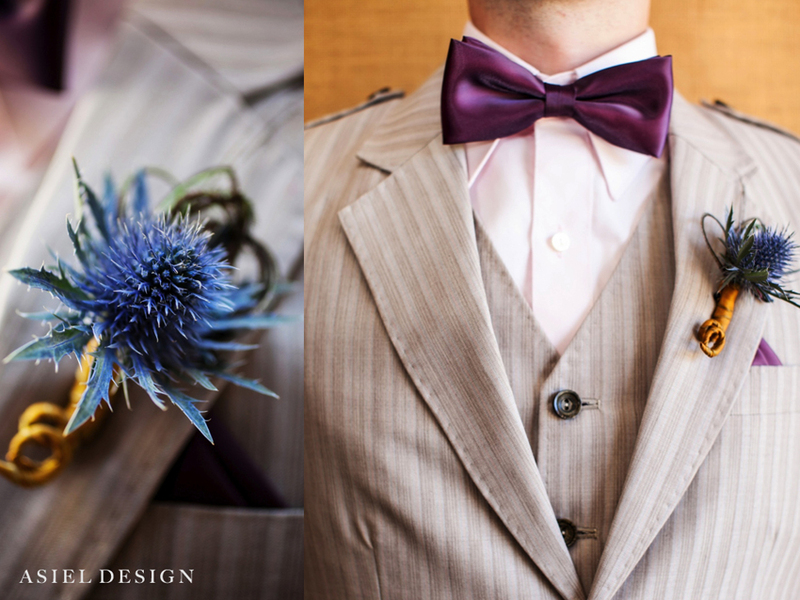 For his boutonnière we did not use a traditional rose or calla lily, rather we chose a thistle. A thistle is actually the flower that grows out of weeds. It’s blue and hearty flower that has architectural qualities to it. Urania did get married in a traditional white dress but she did top of her look with a unique headpiece that boasted small wings. 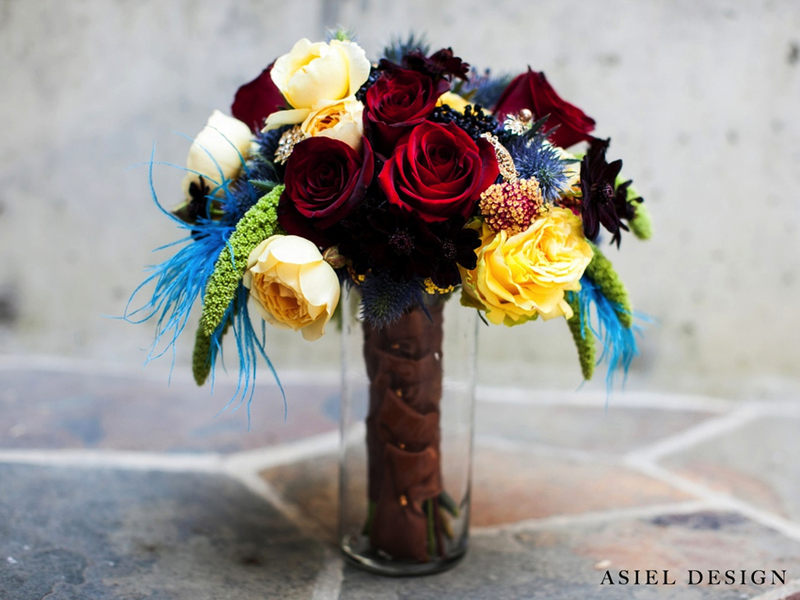 Her bouquet had a lot of great elements and textures as well. 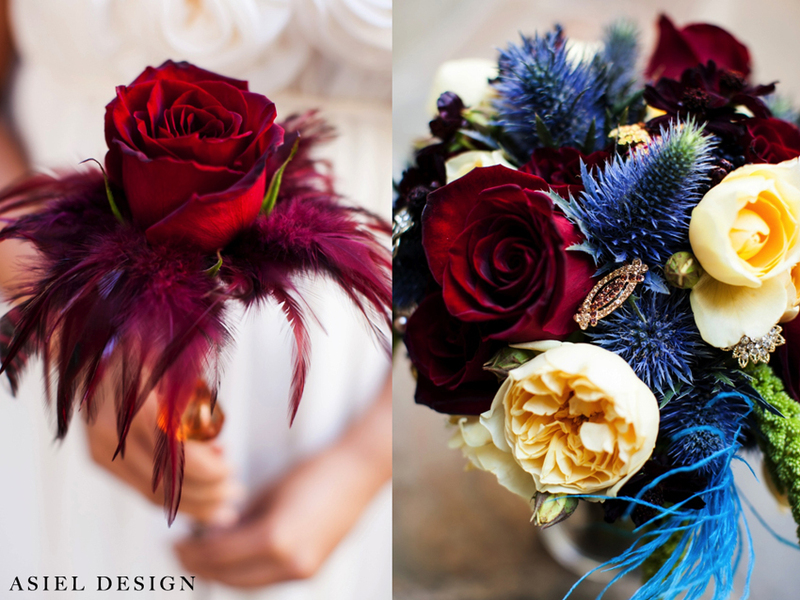 Again we used the thistle and added, amaranthus, Ecuadorian roses, garden roses, chocolate cosmos and feathers. 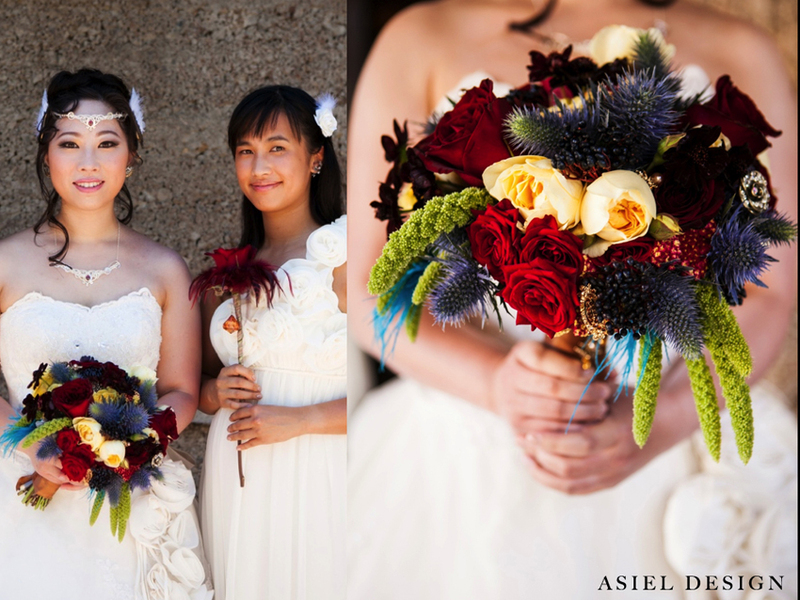 I think the thing that struck me most about her bouquet is the way all the colors went together so well. 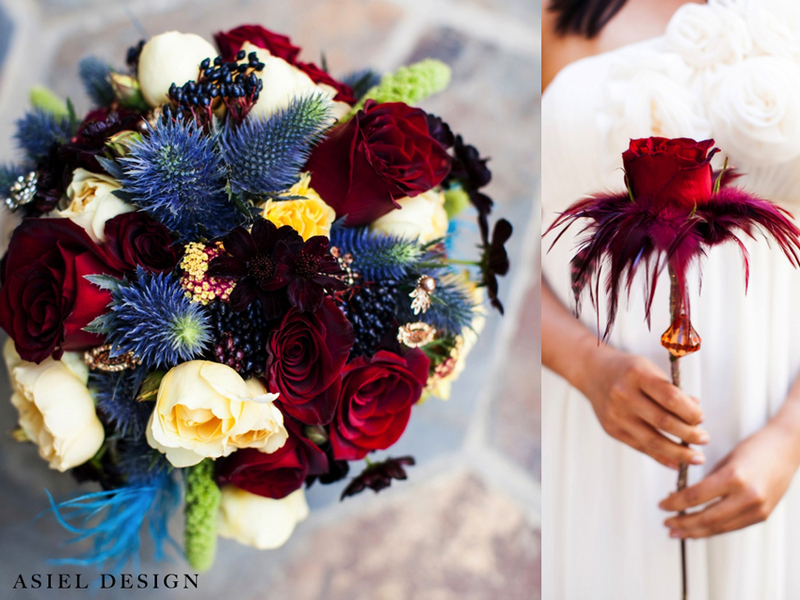 If you were to ask me: “would green, teal, red, burgundy, and yellow (essentially all the colors in her bouquet) flow together?’ I would say “no.” But as we see here I would be wrong. And for the bridesmaid’s of course we would not send them down the isle with a tradition bridesmaid bouquet, but instead we chose to give them a single Black Bacarra rose that was fashioned like a wand. As far as décor I think it really got interesting once we reached the reception. 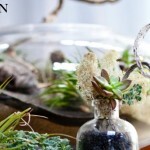 The centerpieces are all one of a kind, custom made pieces that we made from found objects. 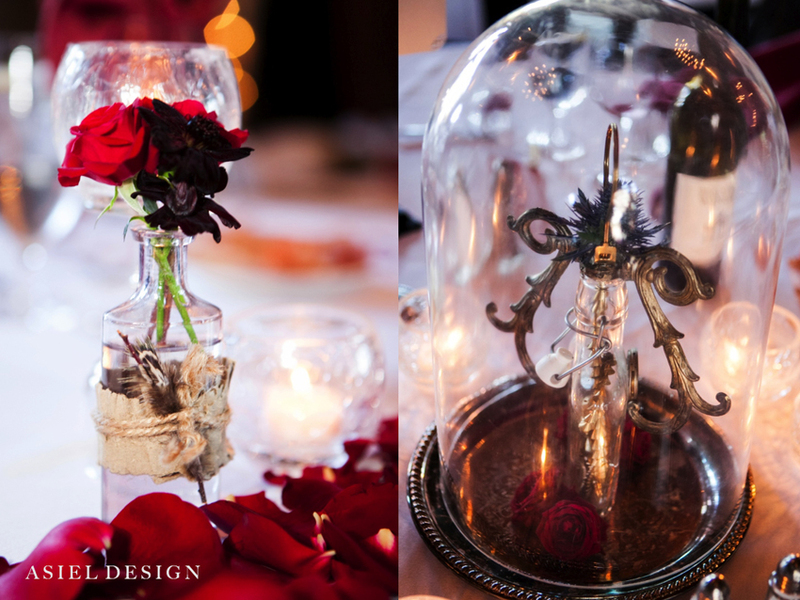 Things like steel wires, bolts, and car parts were made for these little creations that sat on top of guest tables. 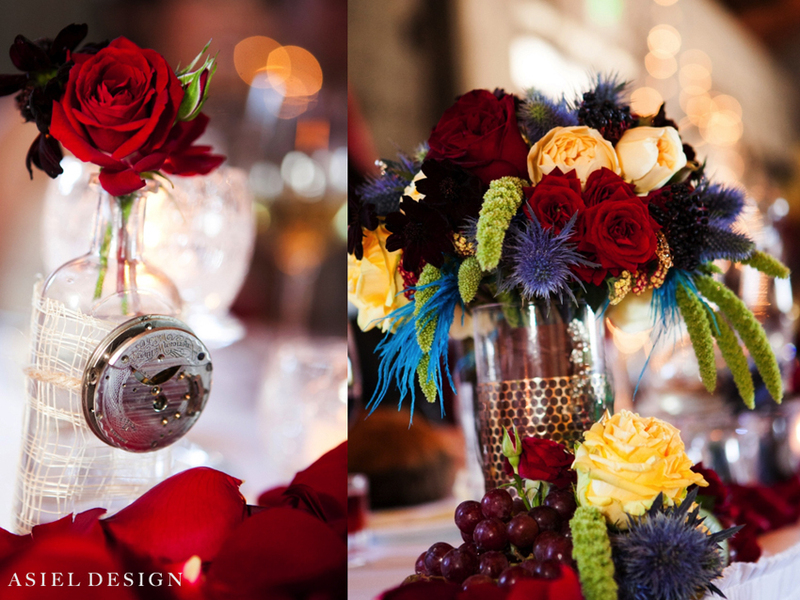 We also used vintage bottles adorned with the interiors of old watches to make interesting vessels for flowers. 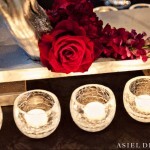 As far as the usage of florals it was very minimal for these centerpieces. It’s almost as if we use flowers to adorn the vessel in which they sit rather than the other way around. Finally we used our very popular lion stands to decorate some of the tables. 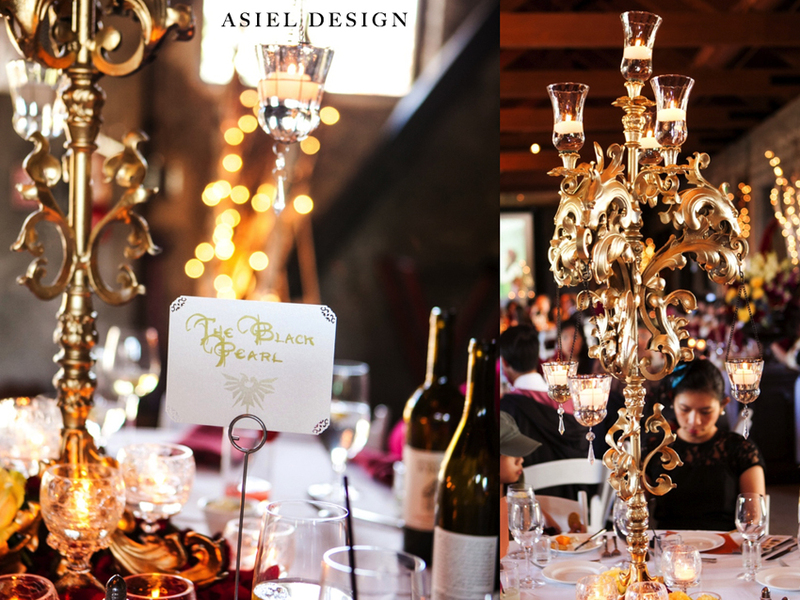 This gold candelabra is always a statement piece that adds drama. This entry was posted in 5k Floral Design, de Young Museum, Green Weddings, Indie Weddings, Mountain Winery, Steampunk, Trendsetting, Vibrant and tagged adeline and grace, eclectic wedding, indie wedding, mountain winery, mountain winery wedding, steam punk wedding, steampunk wedding, super heroes wedding, urania and sean, vibrant wedding. Bookmark the permalink.